The Dashboard is also where an author will spend most time writing and where links to various tools and functions can be found. This chapter will provide an overview of the Dashboard. IMPORTANT: If you have been assigned a user role other than Administrator, you will not have access to the “Users” or “Settings” panels. Select the arrow by a book. Select “Dashboard” to access the edit view. Select “Visit Book” to access the webbook or reader view. On a book’s Dashboard, various tools are listed in the left-hand column Dashboard menu, the parts and chapters of the book are in the middle, and users who have access to the book are shown in a Users box on the far right. For more information, see My Catalog in the Pressbooks User Guide. Most of the major Pressbooks features are found on the Dashboard menu. These are described below. Notice too the Add | Organize options inside the table of contents in the middle of the Dashboard. 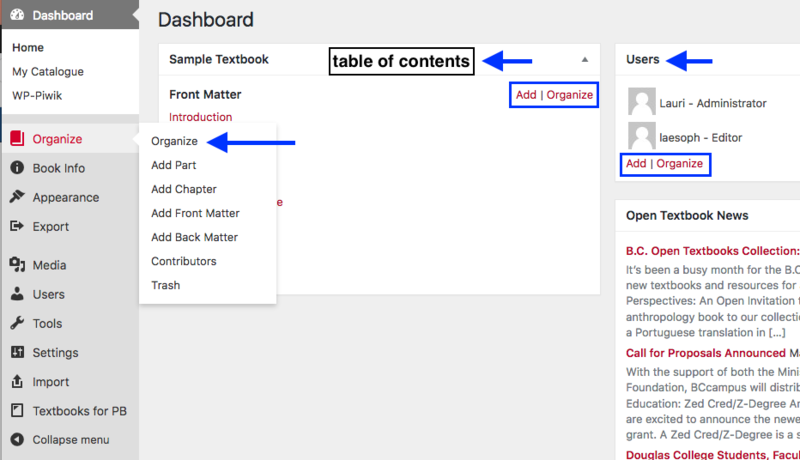 “Organize” is the same as the Organize tab on the Dashboard menu and “Add” allows the addition of a chapter. The Book Info page is where information is added or edited regarding your book, including book title, authors, editors, publisher, copyright owner/year/notice, licence type, descriptions of the book, keywords, and more. Much of the data entered on this page displays on the home page of the webbook and as part of the various exported file formats. It is suggested that the author and/or publisher fills this page out as the book is being written and as information becomes available. This page can be updated as needed. For more information, see Book Info in the Pressbooks User Guide. Also see Book Info Page. For more information, see Appearance in the Pressbooks User Guide. Pressbooks core has created 20 themes, each with different styles (font, headings, etc.) and features. These can be viewed and activated from navigating to the Appearance tab in the Dashboard menu and clicking “Themes.” Scrolling over a specific theme option reveals a Theme details box that, when clicked, describes the theme. For more information, see Themes for Academic and Educational Texts and Theme Lock in the Pressbooks User Guide. Parts and Chapters Numbers: Parts are numbered with Roman numerals and chapters are numbered with Arabic numbers. Two-Level TOC: Enables a two-level table of contents (TOC). Headings marked as Heading 1 will display under chapter titles in the table of contents. Chapter Licenses: Offers choices about the display of copyright licences on export formats (none, at end of table of contents, at end of each chapter). The default is at end of table of contents. Paragraph Separation: Chose between “indent paragraphs” (which will have no spaces between paragraphs) and “skip lines between paragraphs” (which will have no indents). Display Part Title: Have the part title displayed at the top of each chapter. This helps orients readers when they are reading a chapter. Collapse Sections: Collapse all content under Heading 1 headings. Tabbed Content: When these features are turned on, tabs appear at the end of each chapter in the lower left-hand corner of each chapter. Display revision history for each chapter with everyone. Display book information for each chapter with everyone. Body Font Size: The default setting is 11 pt; heading sizes are proportional to the body font size and are affected by this setting. Body Line Height: The default setting is 1.4 em. Page Size: This drop-down list offers a variety of page sizes; the default setting is US Letter (8.5″ x 11″). Margins: The settings for outside, inside, top, and bottom margins; default setting for each margin is 2 cm. Margins must be expressed in CSS-compatible units, e.g. ‘8.5in’ or ‘10cm’. IMPORTANT: If you plan to use a print-on-demand service, margins under 2cm on any side can cause your file to be rejected. Ebook Options: These options apply to EPUB and MOBI exports. Ebook Start Point: Select that Ebook start point from a drop-down list of all chapters. Paragraph Separation: Choose between “indent paragraphs,” which has no spaces between paragraphs (recommended for ebooks for more manageable reading on mobile devices), and “skip lines between paragraphs,” which does not use indents. Compress Images: Reduce image size and quality (chosen by default) for more manageable reading on mobile devices. For more information, see New Theme Options in the Pressbooks User Guide. See Customizing Your Exports with Custom Styles in the Pressbooks User Guide. See Export Files for details. For more information, see Media: Images & Best Practices and Image Editing in the Pressbooks User Guide. The Settings tab contains numerous options for privacy and exporting and for displaying formulas with the LaTeX tool (used for rendering mathematical formulas). See Privacy Settings: Global and Chapter-level in the Pressbooks User Guide. Hypothesis tab: as the administrator of a book, add annotation functionality to book pages. This feature replaces the need to download the hypothes.is browser plugin. 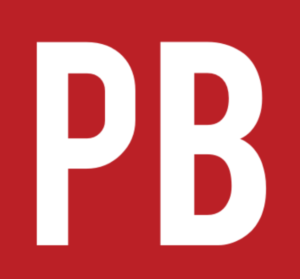 The Textbook for PB (Pressbooks) panel contains tools for importing content from other open textbooks. This page defines open textbooks and other OER, lists their benefits, and describes the 5 Rs behind the CC or open-copyright licence. 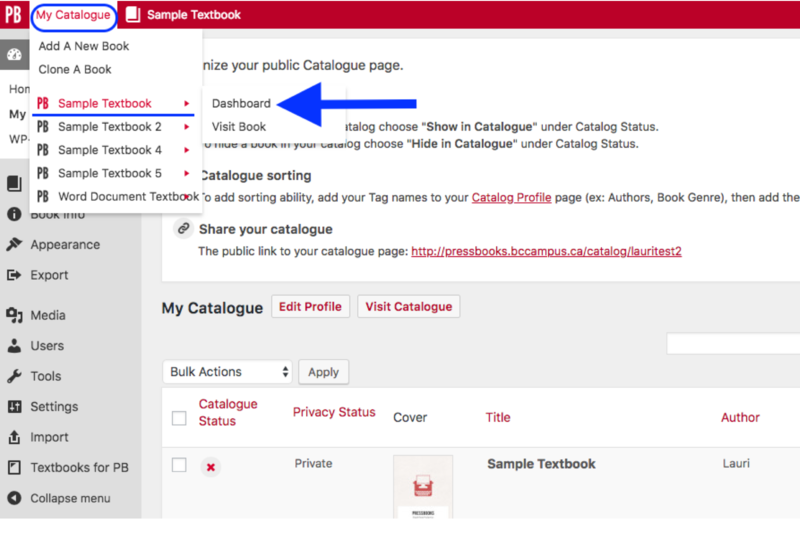 A link is provided to the Textbooks for Pressbooks settings page. The Download Textbooks tool allows Pressbooks users to download open textbooks directly from the B.C. Open Textbook Collection. This is a feature unique to the B.C. Faculty Pressbooks instance. The Dashboard by Lauri M. Aesoph is licensed under a Creative Commons Attribution 4.0 International License, except where otherwise noted.